Whether you are buying, selling or maintaining your home, PacWest Home Inspections provides professional and quality services from the moment you call us. Our licensed home inspectors will walk through your home with you and teach you as much as you want to learn. The American Society of Home Inspectors (ASHI) publishes a Standards of Practice and Code of Ethics that outlines what you should expect to be covered in your home inspection report. After we walk through the home together, We will explain the general condition of the home and systems with you and your agent. We will talk through any major issues that need to be addresses sooner rather than later. We will also mention the items that you will want to keep an eye on for deferred maintenance. All of this will be detailed in our easy-to-read report, that will be delivered via email in HTML and/or PDF format. From that report, you’ll be able to see the items we discussed, with images and videos for reference. View a sample report here. The safety and quality of your home is important to you and PacWest Home Inspection offers additional services to help protect your family and investment. These services can be provided during the home inspection or any time after you have moved and settled in. Many of these services cost a fraction of a home inspection and can give peace of mind knowing costly repairs, sometimes in the $1000’s, are unlikely for your new house. All of our services keep the safety of your family in mind as we have the ability to test for radon, mold, asbestos, or lead. Protect your home with our Builder’s Warranty Inspection before the warranty expires. If any material defects are found, you can take the necessary steps to hold your builder and his subcontractors to their warranties while they’re still in force. We take pride in offering you the best service at the best price. Take a look at our straight-forward price list. Standard with Every Home Inspection. Our 24-hour guarantee is a promise to you. This means at the very latest, you will have the report in your possession within 24 hours of the inspection, or your money will be refunded 100%. We have worked with inspectors in the past who strongly believe in printing the report their on site. With much experience we have found that a “rushed” report can lack crucial photos, illustrations, notes, and format that allows you to understand our findings. PacWest Home Inspections offers aerial imaging as a no charge, as-needed service with every home inspection. 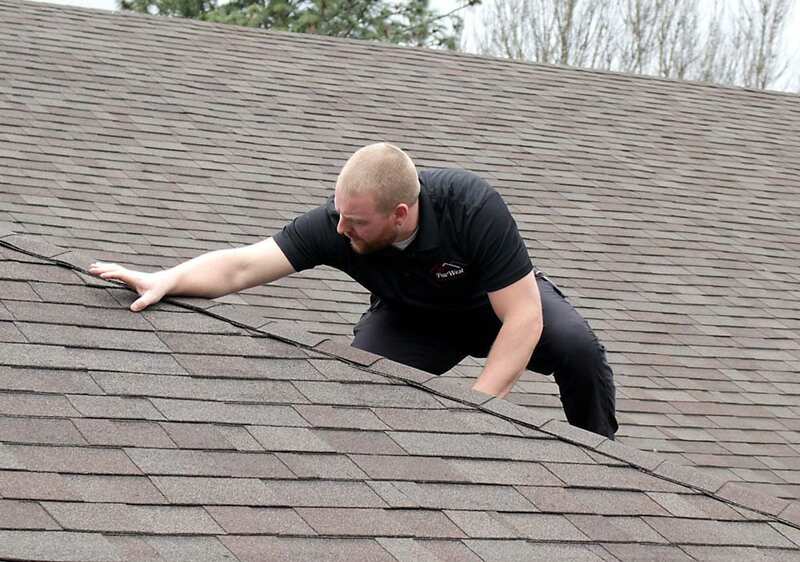 In rare occasions we are unable to physically inspect a roof due to inspector safety or the safety of the home. In these instances we deploy a drone to assist in capturing what could other wise go unseen. Thermal and Moisture Imaging technology has been used for decades and in recent years applied to residential home inspections. Sometimes it is viewed as an add-on service to generate extra income. We believe it should be viewed as a standard tool to look deeper into a home. Thermal and Moisture Imaging are many times the only way to understand why fresh paint, caulking, and texture has been applied to an area. Or why a section of siding is rotting, walls are spongy, and floors are buckling. Thermal and Moisture Imaging services are always provided at no additional charge on every home inspection. See our Additional Services page or find more information in the links below.